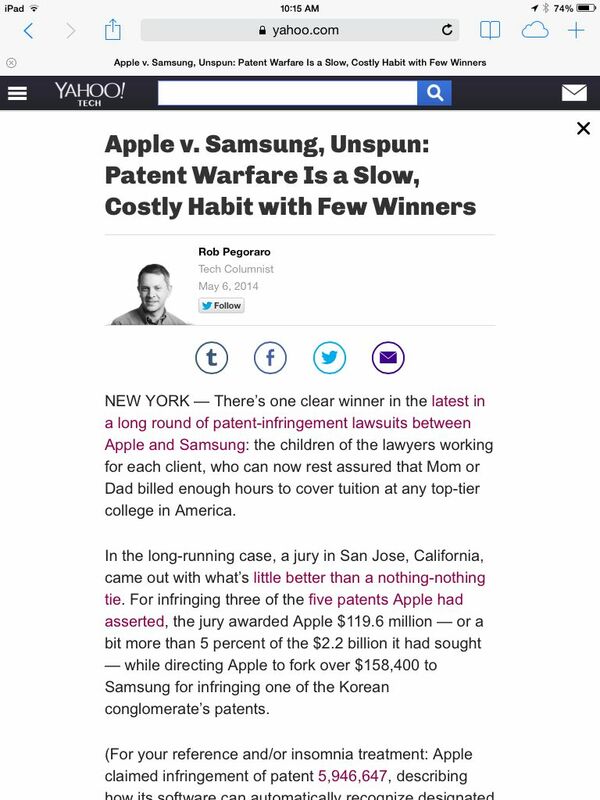 I led off this analysis of the latest Apple v. Samsung verdict by suggesting that the only sure winners were the children of the patent lawyers involved, who could now count on having their college tuition fully covered. A reader countered in a comment: “As the spouse of a former patent litigator, I take issue with the first paragraph. The children of these attorneys do not win in this scenario. The hours spent on this case are hours these parents will never get to spend with their kids. So pretty much everyone loses.” Fair point. Freelance journalist and Columbia j-school student Sara Ashley O’Brien interviewed me for this recap of my friend’s situation. Google’s imminent end of support for a protocol that let third-party Internet-calling apps hook into its Google Voice service meant I had to explain why advice I’d offered a year ago in my USAT column is no longer operative. This entry was posted in Weekly output and tagged android, apple, AppSung, Gmail attachments, Google Voice, GrooVe IP, ios, Judge Lucy Koh, Obihai, Outlook.com attachments, patents, PayPal, Rakesh Agrawal, Rocky Agrawal, Samsung, Talkatone, XMPP by robpegoraro. Bookmark the permalink.